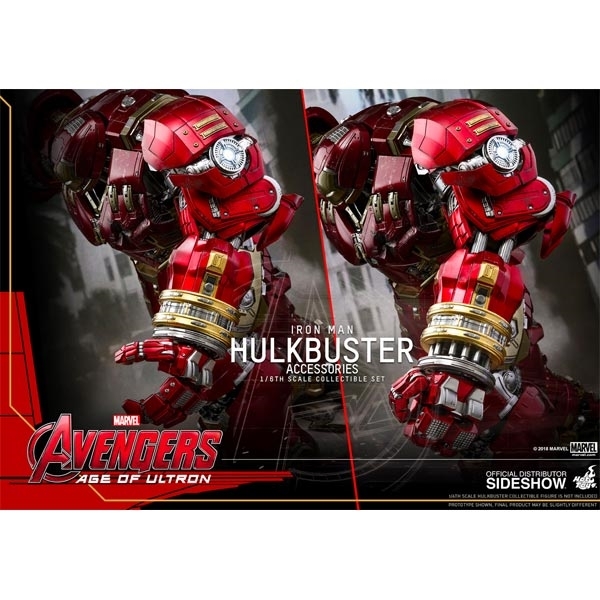 “Veronica, give me a hand!” Specifically designed by Tony Stark and Bruce Banner, the extremely durable Hulkbuster suit can be deployed from orbit. Both Stark and Banner sincerely hope the raw might of the Hulkbuster will never need to be utilized… Given the immense popularity of sixth scale Hulkbuster Collectible Figure, Sideshow and Hot Toys are ecstatic to officially present the Deluxe Version of Hulkbuster Collectible Figure that provides remarkable illumination and a striking appearance! 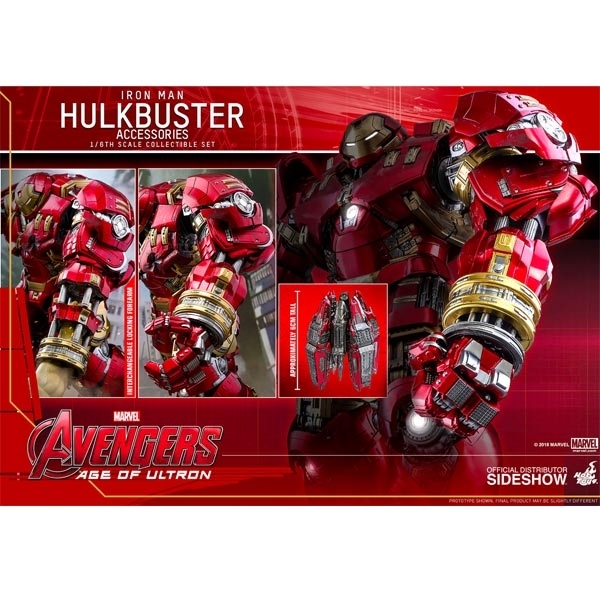 Masterfully crafted based on the appearance of Hulkbuster in Avengers: Age of Ultron, the movie-accurate colossal figure stands approximately 55 cm (21 inches) in height and includes a Mark XLIII bust with LED light-up eyes and arc reactor on the chest that can be placed inside the gigantic machine. 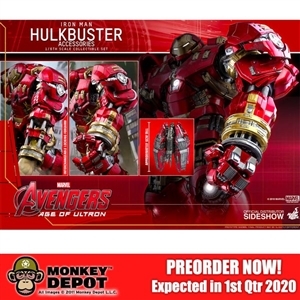 This iconic armor accentuated with metallic red, gold and silver painting and weathering effect features over 20 LED light-up areas located in the eyes, chest, repulsor palms, back, and legs, an interchangeable battle damaged chest armor, also the beautifully designed chest and shoulder armors that highlight the mechanical details. 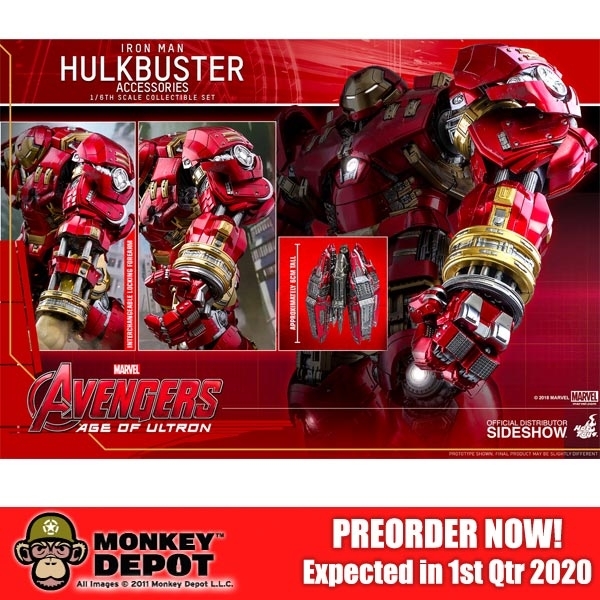 In addition, this Deluxe Version will exclusively include a LED light-up Jackhammer left arm with hand, an interchangeable locking forearm, and a Hulkbuster Pod!